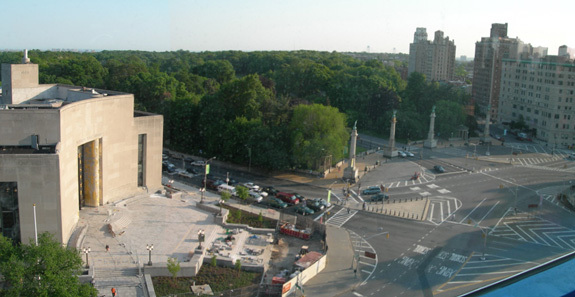 above: the panoramic view from 'Richard Meier on Prospect Park'; see all my photos on flickr. I spent the first half of my life in Brooklyn, and lived in Park Slope for a number of those years. My family and I still visit when we get the urge to get out of town but not too far. All of downtown Brooklyn has been undergoing a transformation over the past decade, but never has its rise been more conspicuously evident than right now. It's a wonderful community, with world class cultural institutions like The Brooklyn Museum, Brooklyn Public Library, The Brooklyn Botanical Gardens, BAM and what many consider Fredric Law Olmsted's finest work in Prospect Park. On Wednesday, there was a party overlooking Mr. Olmstead's work from inside one by a contemporary architectural star, Richard Meier On Prospect Park, the new building overlooking the iconic Brooklyn Public Library, Grand Army Plaza and with views across downtown Brooklyn to the river. This is one of the best park front building sites possible, in all of the five boroughs. It is destined to become a modern classic. Feel free to contact me if you'd like more info about it or other downtown Brooklyn homes. The sales center for the project has been operating out of Tribeca, in Manhattan, during the initial phases of construction. The site is now well enough along so that Corcoran-Sunshine and the developer could introduce the brokerage community to site itself. They enticed us with drinks and sushi over the Brooklyn Bridge, to a rather nice sunset party to see it first hand. After ascending to the still unfinished fourteenth floor at the construction site, the views did not disappoint through Mr. Meier's curtain walls. I snapped a few photos and posted them to my flickr account, if you'd like to see more.